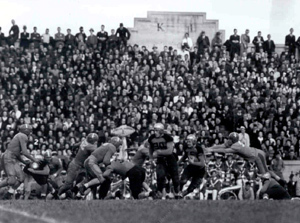 Tennessee vs. Vanderbilt at Shield-Watkins Field, Knoxville, November 12, 1937. When Vanderbilt University organized a varsity football team in 1886, it was probably the first Tennessee college to do so. Maryville College began playing intramural games in 1889 under coach, captain, and quarterback Kin Takahashi. In 1890, Vanderbilt and the University of Nashville played the state's first intercollegiate game. The University of the South (Sewanee) organized a team in 1890, and the University of Tennessee had one in 1891. That same year, Sewanee began its long series of games with Vanderbilt and Tennessee. Maryville College began intercollegiate play in 1892 and Fisk University in 1893. Former players in the Ivy League, especially from Princeton, shaped the new programs in Tennessee. Other schools fielding teams in the 1890s included Carson-Newman College, the University of Nashville, Roger Williams University, Cumberland University, and Southwestern College. By 1894 the popularity of the sport led to the formation of the Southern Intercollegiate Athletic Association (SIAA), with seven charter members, including Sewanee and Vanderbilt. Dr. William L. Dudley of Vanderbilt was the primary organizer, and he served as the president of the SIAA. By 1895 the association claimed nineteen members, which rose to thirty before the organization split in 1920. Vanderbilt also produced strong teams, including the squad on which Grantland Rice played. The golden age of Vanderbilt football arrived in 1904, when Daniel Earle McGugin became head coach of the Commodores. McGugin, an attorney, had played for Fielding “Hurry Up” Yost on the 1901 Michigan team that competed in the first Rose Bowl Game on New Year's Day, 1902. McGugin compiled a thirty-year record at Vanderbilt of 197-55-19 (a .762 winning percentage). His teams pioneered intersectional football for the South by playing Michigan, the Carlisle Indians, Ohio State, Navy, Harvard, Yale, and Minnesota. The Commodores won ten SIAA and Southern Conference championships between 1904 and 1923. The 1904 and 1921 teams were undefeated. Hall of Fame inductee McGugin's biggest stars included Ray Morrison (1908-11), Joshua Cody (1914-19), Lynn Bomar (1921-24), and William Spears (1925-27). Morrison starred as quarterback on the 1910 Vanderbilt team, one of the university's best. That season the Commodores played Yale at New Haven, the first southern team the Elis played. The game ended in a 0-0 tie; Vanderbilt finished the season 8-0-1. Morrison is credited with inventing the “Statue of Liberty” play in his first season at Vanderbilt. When later asked about the innovation, Morrison claimed that he first used the play at McTyeire School for Boys in McKenzie. A Hall of Fame coach, Morrison was head coach at Southern Methodist University from 1915 to 1916 and 1922 to 1934, where he created the “Aerial Circus” that sold passing to the country. In 1923 Morrison coached the SMU team to a national championship. He returned to Vanderbilt in 1935, and in 1937 the Commodores first used the hidden ball play to beat Louisiana State. Morrison left Vandy after the 1939 season to coach at Temple and Austin College. Three McGugin associates of the 1920s also made their mark on football: William Wallace Wade, Jess Neely, and Henry “Red” Sanders. Wallace, born near Trenton in Gibson County, was assistant coach under McGugin in the 1921 undefeated season. In 1923 he became head coach at Alabama, posting a 61-13-3 record before leaving in 1931 to coach Duke University for the next sixteen years. He compiled an overall record of 171-49-10 (.765). Neely, a Smyrna native and captain of the 1922 team, swapped his Vanderbilt law degree for a high school coaching position before going on to coach at Southwestern at Memphis. Assistant to Wade at Alabama from 1928 to 1930, Neely became head coach at Clemson (1931-39) and then Rice (1940-66). A Nashville star athlete, “Red” Sanders played quarterback under McGugin from 1923 to 1926. He became Vanderbilt head coach in 1940, left for military duty in 1942, and returned to coach the Commodores from 1946 to 1948. Sanders went on to become head coach at UCLA, where he built a national power, losing only three games from 1952 to 1955. All three men–Sanders, Wade, and Neely–are in the Hall of Fame. During the “football frenzy” years of the teens and twenties, other Tennessee teams also made history. The Fisk Bulldogs lost only one game between 1899 and 1904 and continued to field strong teams through the 1920s. Fisk won eight Southern Football championships between 1910 and 1929. Their 1916 team gained the National Black Football Championship. Henry Arthur Kean, later a great Tennessee State University coach, was an All-American on that team. Henderson A. Johnson built highly regarded teams in the 1920s, but Fisk's dominance declined after 1933. Another Tennessee team established a record that will probably stand forever. On October 7, 1916, Lebanon's Cumberland University Bulldogs, under student coach and manager George E. Allen, played Georgia Tech, coached by John Heisman (for whom the Heisman Trophy is named). Cumberland lost to the Yellow Jackets 222-0. Georgia Tech went on to win the Southern Championship that year and the national championship in 1917. Cumberland University's loss stands as the greatest loss in college football history. Grant University (later the University of Chattanooga and now the University of Tennessee at Chattanooga) played its first seven-game season in 1905, beating the University of Tennessee and losing only to Cumberland University. Chattanooga became a member of the SIAA in 1913 and acquired Frank Thomas as head coach (1925-28). Chattanooga tied for the SIAA championship in 1926 and won the title in 1927 and 1928. Chattanooga left the SIAA in 1930 for the Dixie Conference of nine small colleges. They won the 1931 Dixie championship during the first year of Andrew “Scrappy” Moore's 1931-67 tenure as the school's coach. Both Thomas and Moore were inducted into the National College Football Hall of Fame. In December 1920 fourteen of the larger SIAA schools formed the Southern Conference, with the University of Tennessee as a charter member. By 1928 the Southern had twenty-three members, including Vanderbilt and Sewanee. In 1921 Tennessee dedicated Shields-Watkins Field, named for its donors, Colonel W. S. Shields and Alice Watkins Shields. The next year, Vanderbilt opened Dudley Field, named for football leader William Dudley; the twenty-thousand-seat stadium was the largest in the South. In 1925 Nathan W. Dougherty, engineering professor and chairman of the University of Tennessee athletic association (and a Hall of Fame guard at UT from 1906 to 1909), hired Robert Reese Neyland Jr. as assistant coach and military instructor. Neyland became head coach of the Volunteers in 1926 and launched a new chapter in football history. During McGugin's tenure at Vanderbilt, Tennessee had won only two games and tied once in twenty-one games against the Commodores. Dougherty reportedly ordered Neyland to even the score with Vanderbilt. Neyland obeyed the command, and McGugin never won against Tennessee after 1926. Following McGugin's retirement after the 1930 season, Vanderbilt has won no other conference championships in the Southern or the later Southeastern Conference. Neyland brought football knowledge to Tennessee that he learned from the sport's greatest coaches. He first played college football in 1910 at Texas A&M under former Tennessee player Charles Barthell Moran. As assistant coach under Scobey “Pop” Warner at Carlisle Indian School, Moran was head coach at A&M from 1909 to 1914, compiling a 38-8-4 record, and at Centre College in Kentucky from 1919 to 1923, where he went 42-6-1. At Centre he won national recognition when his 1921 team beat Harvard 6-0 during an undefeated season. Neyland then transferred to West Point in 1912, where he was coached by Charles Daly. Daly quarterbacked the 1898 Harvard team. He later coached with former teammate Percy Haughton. Neyland absorbed the Haughton-Daly methods and maxims: the kick was the basis of play, and perfection was required in the fundamentals. Neyland believed in their maxims: “the team that makes the fewest mistakes wins,” “make and play for the breaks,” and “protect our kickers, our QB, our lead, and our ball game.” He passed those methods and maxims to players and assistants who later became head coaches, including Bobby Dodd, Bowden Wyatt, Allyn McKeen, Murray Warmath, Billy Barnes, Bob Woodruff, DeWitt Weaver, Jim Myers, Herman Hickman, Beattie Feathers, and Ralph Hatley. With military precision, Neyland made defense his main forte, emphasized a flawless, airtight kicking game, and was obsessed with pass defense. In 188 regular season games, Tennessee held the opponent to an average of 5 points per game. Neyland's name became synonymous with the single wing system with its backfield of tailback, fullback, blocking quarterback, and wingback. Neyland served as head coach at Tennessee from 1926 to 1934, when he was assigned to duty in Panama, before returning to Tennessee (1936-40). He performed military service during World War II and rose to the rank of brigadier general. Neyland returned to Tennessee as head coach in 1946, where he remained until 1952. In his first nine seasons, Neyland amassed a 77-6-5 record, with undefeated teams in 1927, 1928, and 1929. He also led undefeated teams in 1938, 1939, 1940, and 1951. Four of the seven were perfect seasons, and his overall record was 173-31-12 (.829) over twenty-one years, making him one of the all-time winningest college coaches. Eleven Neyland players entered the National College Hall of Fame for their play and/or coaching. Neyland's teams brought home the only Southern Conference championships won by Tennessee–in 1927 and 1932–and five Southeastern Conference championships. Although Neyland stuck with the single wing system throughout his career, college football began to make major changes as early as the 1930s, as new formations and methods were adopted. The sophistication among larger teams was underscored in December 1932, when thirteen major Southern Conference members from west and south of the Appalachians met in Knoxville to realign as the Southeastern Conference (SEC). Sewanee, Tennessee, and Vanderbilt were charter members, although Sewanee left the conference after the 1940 season. In 1936 the Associated Press began its poll to rank college teams across the country. Neyland produced eight top-ten teams between 1938 and 1952, but only the 1951 team attained the national championship. In the immediate postwar years, teams changed strategies, formations, and personnel. The dominance of teams in Tennessee changed too. Vanderbilt failed to reclaim the glory of the McGugin era, despite the efforts of “Red” Sanders and his assistant coach Paul “Bear” Bryant (1940-41). About 1960 Vanderbilt attempted to form a new conference, but ultimately remained in the SEC. Memphis State (now University of Memphis) saw new successes. Fielding its first team in 1912 as the West Tennessee State Normal School, Memphis played as many high schools as colleges in the early years. In 1927 the “Teachers” won the Mississippi Valley Conference championship under coach Zach Curlin, a former McGugin player, and assistant Allyn McKeen, a former Neyland player. McKeen became head coach in 1937 and followed his instructions to install the Tennessee system. In 1938 Memphis recorded a 10-0-0 perfect season and was recognized as the highest scoring team in the nation, racking up 281 points to their opponents' 35, with five shutouts. That year Memphis won the SIAA championship. In 1939 McKeen went to Mississippi, where he coached halfback Billy Jack “Spook” Murphy on the 1941 SEC championship team. In 1947 Memphis State hired head coach Ralph Hatley, a Neyland star from the early 1930s, and the school soon built a major football program. Hatley coached until 1957, acquiring a 47-36-5 record. Assistant “Spook” Murphy succeeded Hatley as head coach in 1958 and earned a 91-44-1 record before his retirement in 1972. Murphy's 1963 team was the school's first undefeated team in twenty-five years, and Murphy was named national coach of the year. The school with the greatest national success in its division, however, was Tennessee State University. Its first team hit the gridiron in 1912. TSU became a powerhouse largely through the vision of President Walter S. Davis, who saw the college as a great training ground for athletes of all sports. Davis hired Henry Arthur Kean, head coach for the Tigers from 1944 through 1954; Kean had been an All-American player on Fisk's national championship team. In 1946, 1947, and 1954, TSU was national champion in its division. In Kean's last season, the team compiled a 10-0 record. Kean's overall record as head coach (1930-54) was 162-30-5 (.822). Howard Gentry, Kean's assistant, was head coach from 1955 to 1960. TSU won the National Black Championship again in 1956, playing in the Orange Blossom Classic in Miami, the great bowl of black college football. That same season, Gentry was named coach of the year. In 1961 TSU reigned as champion once again. John Merritt maintained TSU's dominance throughout the 1960s and 1970s, producing such star National Football League players as Ed “Too-Tall” Jones, Waymond Bryant, and Joe Gilliam. The dominance of the UT Volunteers remained steady for most of the 1950s. Bowden Wyatt, captain of Neyland's undefeated 1938 team, became head coach at Tennessee in 1955. Wyatt had previously coached at Wyoming (1947-52) and Arkansas (1953-54), leading both schools to their respective conference championships. Wyatt's 1956 UT team, which included future coach John Majors, was undefeated, and Wyatt won recognition as national coach of the year. The price of Tennessee's continuing power has been the determination of other in-state schools to defeat the Vols. In 1958 Chattanooga's upset victory over UT marked the school's first win against the Volunteers since 1905. The upset was surpassed in 1996, when the University of Memphis beat the fifth-ranked Volunteers. Neyland died in 1962, and Bowden Wyatt left Tennessee that spring. In 1963 Bob Woodruff became athletic director and hired Doug Dickey, who had played for Woodruff at Florida, as head coach in 1964. Dickey's teams won SEC championships in 1967 and 1969. It was an even more successful decade for Tennessee State University. John Merritt came from Jackson State to become head coach at TSU in 1963, a position he retained until 1983. The Hall of Famer was coach of the year in 1964 and 1965 and won back-to-back National Black College championships in 1965 and 1966. Merritt also coached teams to Small College National Championships in 1973 and 1979. TSU brought home ten national championships in its college division from 1946 to 1979. TSU is now a member of the Ohio Valley Conference (OVC); it won the conference championship in 1998 and 1999. The other Tennessee member of the OVC is Tennessee Tech. Of the old OVC rivalries, the one between Tennessee Tech and Middle Tennessee State University (MTSU) had the longest and most intense history. The two teams played an annual “Totem Bowl” game, the name being a reference to a trophy given to the winner by Fred Harvey, who owned a chain of Middle Tennessee department stores. Tennessee Tech recorded an 8-3 record in 2000. MTSU, under coach James “Boots” Donnelly, emerged as a major Division I-AA power during the 1980s. Donnelly came to MTSU after two years as head coach at Austin Peay State University (1977-78), where the Governors won the 1977 OVC football championship. A former MTSU defensive back, Donnelly has coached the Blue Raiders since 1979, guiding the team to four OVC championships and seven I-AA national play-off appearances. In the mid-1990s the success of MTSU as a Division I-AA school led them to begin the transition to Division I-A status. In 1999, under coach Andy McCollum, a former Donnelly assistant and respected football recruiter, Middle Tennessee left the OVC and participated in Division I-A as an independent; in 2000 it joined the Sun Belt Conference and recorded a mark of 6-5. The dominant team of the 1990s in Tennessee football was the University of Tennessee. The roots of its current success as an acknowledged national powerful date back a generation. In 1977 John Majors returned to the University of Tennessee as head coach. He began his career as student coach for Wyatt, and after a stint at Mississippi State, went to Arkansas under Frank Broyles. There Majors met Dickey, who was also on staff at Arkansas. As head coach at Iowa State (1968-72), Majors became 1971 national coach of the year. In 1973 he became head coach at the University of Pittsburgh and coached Pitt to the 1976 national championship with Heisman Trophy winner Tony Dorsett. Majors coached at Tennessee from 1977 to 1992. He posted 115 SEC victories, ranking in the top ten all-time SEC coaches for wins. His teams won three SEC championships. Majors returned to Pitt as head coach in 1993 and retired from coaching in 1996. After 1992 former UT player and assistant coach Phillip Fulmer of Winchester became head coach at UT. His teams have won a national championship (1998), two SEC championships (1997 and 1998), and have compiled an overall record of 84-18. His 1998 team is the only one in Tennessee football history to record a mark of 13-0; Fulmer won the national coach of the year award in 1998. His teams have included two Heisman Trophy candidates (Heath Shuler and Peyton Manning) and the 2000 Outland Trophy winner, John Henderson.